Modern homeowners pay well-drilling companies to create a safe and clean source of drinking water on properties outside of municipal water districts. Digging your own well requires only the right tools and the dedication to go through the hard work. However, hand-dug wells combine some advantages with serious disadvantages. Most old wells were hand-dug. 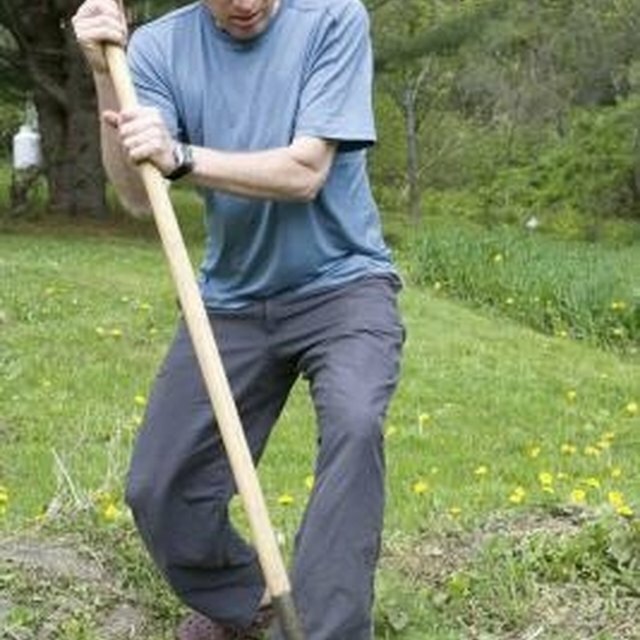 Digging with a shovel or pick limits the depth a hand-dug well can reach. In areas where the water table lies far below the surface of the ground, a shallow hand-dug well may never hit the water source, according to the US. Geological Survey. Even if you do hit a water table, there's a chance that it won't supply enough water to make it worth digging the well. Having the water table measured and charted before starting the digging saves time and effort. You don't need a lot of heavy equipment or specialized tools to dig a simple well yourself. If you have a partner, all you need is digging equipment like a shovel and a bucket to remove soil and rocks with, says the Laymen's Guide to Clean Water. Without a partner, a pulley and tripod will help you lift debris out of the pit as you dig. A ladder is also required to allow you quick escape from the well if it begins to collapse or fill with water. Unlike hand-drilled wells, a hand-dug well requires lining. This allows you to control what comes in contact with the water. Concrete supports the sides of the well and prevents collapse, according to WaterAid. Well diggers add precast concrete rings as they go deeper, or they stop and pour concrete down the sides of the well every so often. Basic stone or brick linings work but aren't as strong, making them less effective at preventing wall collapses. A hand-dug well poses more dangers and risks than a drilled well. Aside from the obvious risk of falling in an uncovered well, surface runoff contaminates a shallow dug well much easier than a deeply drilled one, says Inspectapedia. You'll need to take more care not to use pesticides or other dangerous chemicals anywhere near the well. Wells commonly collapse during digging if supports aren't used. Don't enter a hand-dug well or attempt to dig one without structures in place to support the walls. What to Do About Rusty Well Casings?